My whipped body butter, which works pretty well in a pinch but isn’t scented enough and is more oily than I’d like. And as of the past few days, I’ve tried out my solid perfume, which I actually really liked as a deodorant, but it still wasn’t perfect. I learned long ago to ditch the antiperspirant and am OK with sweating; since it is a beneficial service my body provides– ridding itself of toxins and regulating body temperature. I am not trying to stop that natural function, I’m just trying to smell fresh as a daisy while it happens 🙂 That is totally doable in fun and frugal fashion when you make your own deodorant! Aluminum-based compounds are the active ingredients in antiperspirants. They block the sweat glands to keep sweat from getting to the skin’s surface. Some research has suggested that these aluminum compounds may be absorbed by the skin and cause changes in estrogen receptors of breast cells. Because estrogen can promote the growth of both cancer and non-cancer breast cells, some scientists have suggested that using the aluminum-based compounds in antiperspirants may be a risk factor for the development of breast cancer. Parabens in their many forms (methylparaben, propylparaben, ethylparaben, or butylparaben) are a class of artificial preservatives widely used in cosmetics and personal care products that are being investigated for their possible role in breast cancer. Parabens mimic the activity of estrogen in the body. Since estrogen promotes the growth of breast cancer cells and a woman is eight times more likely to develop breast cancer in the part of the breast closest to the underarm, scientists are studying the connection. Although parabens have estrogen-like properties, the estrogens that are made in the body are hundreds of times stronger. So, natural estrogens (or those taken as hormone replacement) are much more likely to play a role in breast cancer development. Propylene glycol—a humectant which means it keeps substances from drying out, and it was originally developed as an anti-freeze, but is now included in some deodorants and antiperspirants. It is a neurotoxin known to cause contact dermatitis, kidney damage, and liver damage. In propylene glycol’s Material Safety Data Sheet (MSDS), published by the National Institute for Occupational Health and Safety, workers are urged to avoid skin contact with the toxic chemical as it may cause eye and skin irritation, gastrointestinal irritation and discomfort, nausea, headache, vomiting, and central nervous depression. TEA and DEA (triethanolamine and diethanolamine) adjust the pH, and used with many fatty acids to convert acid to salt (stearate), which then becomes the base for a cleanser. They both could be toxic if absorbed into the body over a long period of time where DEA can cause liver and kidney damage and TEA can cause allergic reactions. These chemicals are already restricted in Europe due to known carcinogenic (cancer-causing) effects. Triclosan is an artificial antimicrobial chemical used to kill bacteria on the skin and other surfaces. Triclosan is a skin irritant and may cause contact dermatitis. Recent studies suggest this chemical may disrupt thyroid function and other critical hormone systems. The American Medical Association recommends that triclosan and other “antibacterial” products not be used in the home, as they may encourage bacterial resistance to antibiotics that can allow resistant strains to flourish. FD&C colors are artificial/synthetic colors approved by the FDA for food, drug and cosmetics. Some are made from coal tar derivatives and have known to be carcinogenic; they also often cause allergic skin reactions. Talc, hydrous magnesium silicate, is a soft mineral used in personal care products as an absorbent and color additive. It is classified as a carcinogen by the International Agency for Research on Cancer if it contains asbestiform fibers. The quantity of asbestiform fibers in cosmetic grade talc is unregulated. If talc is listed on the label, there is no way of knowing whether or not it contains asbestiform fibers. The easiest way to stay safe is to make your own cosmetics. That way you know EXACTLY what you are putting on your body. My motto is, if I can’t eat it, I shouldn’t use it. Plain and simple. …a family of fungi. Different strains of saccharomyces are used to ferment beer and wine, and even to raise bread (yeast is a strain of saccharomyces). The saccharomyces ferment used in deodorants is… non-toxic and harmless, and contains live enzymes that help to break down odor-causing compounds. [It is] describe[d] it as ‘a water-soluble liquid derived from the fermentation of vegetable feedstock.’ From all information [Stephanie] can find, this looks like a safe ingredient. It’s not much different from the bacteria and enzymes found in kefir and kimchi. Since I have no idea where to get the saccromyces ferment, I thought shelf-stable probiotic powder to be a worthy substitute. The concept is simple; in that by adding a probiotic, one could improve the balance of good bacteria vs. bad bacteria on one’s skin instead of eliminating all bacteria all together (as with commercial products). Keeping the delicate balance of healthy flora intact is key; inside and outside the body. Respecting and supporting the body’s systems is most important. I used 10 tea tree, 10 sweet orange, and 10 lemongrass. It smelled amazing!!! On the stovetop, melt coconut oil, cocoa butter and beeswax, stirring with wooden chopsticks, or a small spatula. 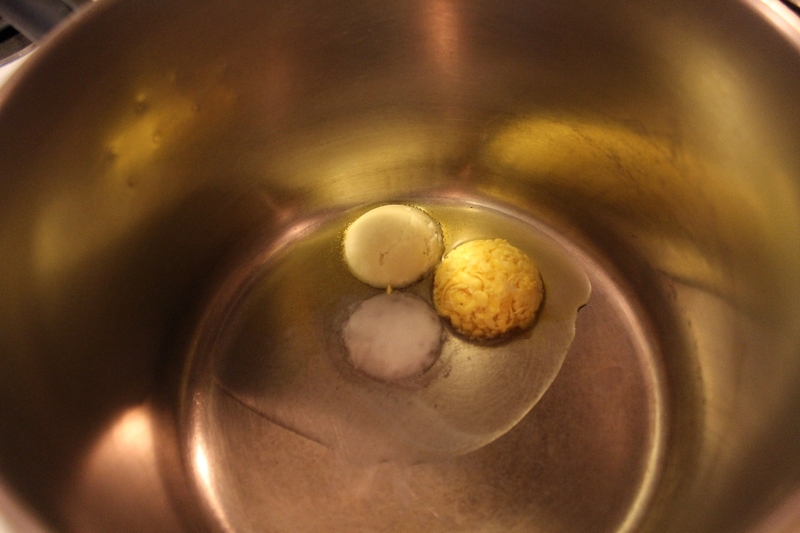 Next, melt the shea butter, (since shea doesn’t LOVE to be heated too long, it goes in last). Add the arrowroot and clay, stirring well. Remove from heat and add vitamin E oil. Let the mixture cool to the consistency of pudding and then add probiotic capsules and essential oils (if using). 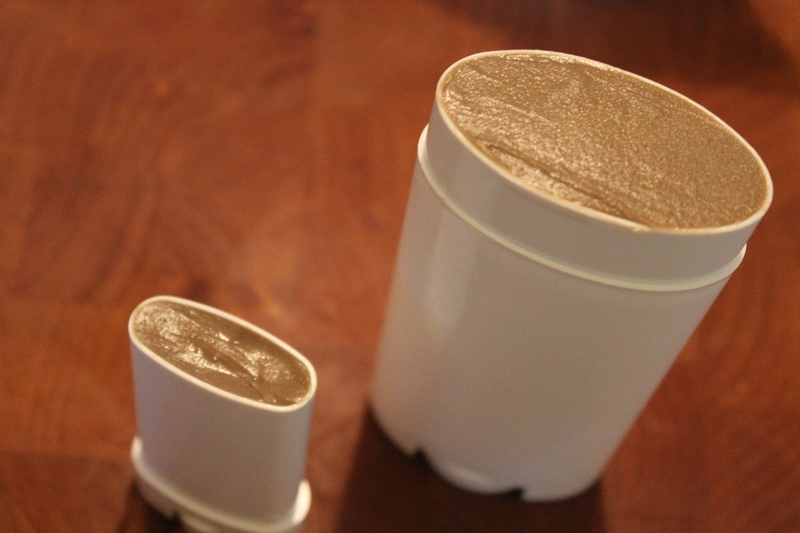 With a small spatula, press into deodorant container, making sure that the tube is rolled all the way down. Let cool and harden in the fridge for one hour and store for 24 hours with the lid off to allow the product to set up. Can be used right away though, once the product is has cooled. Stores well on the counter (room- temp), and will keep for several months. Being a frugal person, I don’t crank my air conditioner down during the summer. My coconut oil stays liquid all summer. Does the beeswax keep this solid? Or would I have to keep it in the fridge? I have probiotic capsules that are refrigerated. Are those ok to use? Believe me, if your temps get higher than the low 70’s ( I live in the Desert Southwest) you NEED to add some beeswax to the mix. Coconut oil has a low melting temp. I understand your use of arrowroot instead of corn starch as an additive to your deodorant because of the fact that corn in this country is GMO. But corn in the US HAS BEEN GMO for quite a LONG time (meaning decades). I despise the FDA as much as you do but your statement of the non use of corn starch is no more than a political statement. Please let’s keep politics out, unless you want to use your blog for political reasons. I have had to delete so many blogs I’ve subscribed ( and not subscribed to) because of their constant ranting. Also, I don’t see how cornstarch applied externally to the underarms by virtue of being GMO is going to cause any ill affect by absorption. Not a logical statement. Internally, yes. Externally? Uh.. I think it is a matter of your personal preference and political inclinations. Another thing mentioned is to forgo talc which I totally agree with, for geologically, talc lays next to asbestos in the earth. But your only option for dusting powder is… corn starch? 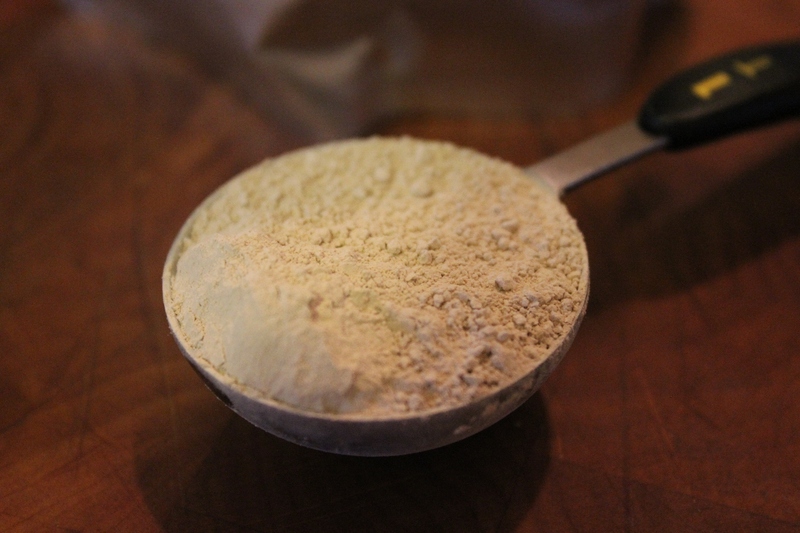 I have yet to see arrowroot powder made into a dusting powder and if it is, it must be quite costly. You do know that even just wearing cotton shirts are dangerous because most cotton is gmo. So yes, she makes a valid point about cornstarch being used externally. Gmos are still toxic just used on our skin. You need to do more research before making comments like this. Not to mention that cotton fiber is loaded with pesticides, namely chlorinated hydrocarbons, organo-phosphates and carbamates. Most of our cotton fabric in the US is coming from China. Monsanto is making big bucks with Roundup which is a very toxic herbicide plus they provide the seeds to those farmers, be it cotton, corn or soy. Have you read recently that Monsanto wants to sue the State of Vermont because they’ve refused to use their seeds? Not the US I grew up in. I actually lived in China for three years. The idea that something made there is automatically horrible is also a fallacy. 🙂 If that were true, then the country wouldn’t be *nearly* as well populated as it is. After doing some research on the ingredients used in these home-made deodorants, I don’t see them as any safer than what I can buy in the store. Corn starch isn’t good for your skin, because it blocks pores. Baking soda isn’t good for skin, because it can change the pH balance in your skin to dangerous levels. In the end, anything other than your natural sweat is going to be dangerous, apparently. Basically, unless you go around naked and stinking, with never bathing, then you are likely to….what? Keel over in the street from Secret deo and a cotton shirt? You can drink chlorophyll added to your water. It strips your body of toxins,basically acting like an internal deodorant. Cornstarch is associated with an increase in Candida overgrowth. I personally don’t use it at all. I’m so glad you give background on the toxic ingredients of deodorant and how they might affect us all negatively. I didn’t know for WAY too long! Thank you! Also, thank you for pointing out the GMOness of Corn Starch – I totally didn’t think of that. I like to support sustainability with my dollars, when I can, but don’t always connect all the dots. You’re so helpful! Hi, I too use a similar recipe as yours, but never thought of the clay. I was wondering, can you please tell if the clay has stained your clothing under the arms? I make my own toothpaste and use bentonite clay and one really needs to get used to the coloring of your toothpaste! Especially when spitting it out! LOL. Hi Colleen, you are spot on about the color! It’s weird to spit brown 🙂 The deodorant has not stained any of my clothes, but, I rub it in until I can’t sere the color any more. I arn sure if you put it on real thick, there’d be trouble! I ordered the Kaolin clay from Mt rose and as always I click on the “more info” tab & read the ingredient list and gee there is aluminum in the clay so just how much alum. in natural form can b used? Not sure I want 2 use any alum. Hi Georgia, I saw that too. Looked into it and it seemed to be different than the harmful one in conventional different. I forget what sites I was looking at, it was a while back. I just goggled it. You could easily omit the clay and ad more arrowroot or baking soda. The aluminium in kaolin is tightly bound in a silicate molecule and is rendered inert. It can even be safely ingested, where, like other clays absorbs toxins. Baking soda is never a good idea as its PH is a bit corrosive to delicate skin and would probably kill the good bacteria too. This is something I’m going to pin and try later. I started just using straight coconut oil as a deodorant but it’s just so runny since our climate here is very hot and humid. But I want to try your way. It looks really easy and since we are all about being a non-gmo family, this recipe is perfect. Thank you for posting! I’ve been doing this as well for the better part of a year, following several years of frustratingly negative results with a number of natural deodorants I purchased from various sources. I find it generally works in the winter, and only occasionally do I have to reapply some later in the day. But if I get hot and sweaty here in the summer, I start smelling. So I knew I needed to either augment this method or try something else. I decided to search online for further advice–especially on using essential oils in combination with the coconut oil–and possible recipes, but there’s so much conflicting information and no clear-cut consensus that it’s hard to settle on what to do. (This is the first site I’ve even seen references to good bacteria in relation to our armpits; I didn’t know I had to worry about that.) But to start, I’m going to try to be as simple as possible: I’ve read a couple of websites’ suggestions about alcohol, so I first swipe some rubbing alcohol under each arm with a cotton ball and let that dry; then I rub in my usual coconut oil with my finger. I just began this today, in fact, so the jury’s still out on whether or not it’s effective. Fingers crossed! What an awesome recipe! I would LOVE to try it sometime… looks like a great herbal product to make with my almost teenage daughter! I really like your idea! I’ll have to give it a try. I’ve been using a tea tree/lavender essential oil blend and baking soda. I dab the oil on first and rub it in a little, then pat dry baking soda on top. It’s worked so far, just don’t use a baking soda with aluminum. Thanks for the tip, Rachel. I bet this would work well for folks in the ultra-warm climates! Baking soda is a naturally occurring mineral (or at least, it can be) and contains no aluminum. Baking POWDER, on the other hand, often does. This is a common misconception in the same way that people assume gummybears being advertised as “gluten free” might assume other gummybears contain gluten (they don’t). This is nothing but cheesy marketing tactics some companies use to get an extra buck out of you. I’d like at add another option for application. I have made my own deodorant for several months and have recycled a tube as well as used it straight out of a small bowl. To apply out of a bowl I have a dedicated spoon. I put a small amount of deodorant on the *back* of it and rub it on. No messy fingers but still gets applied where it needs to be. 😀 Thanks for the recipe, I’ve pinned it to try for my next batch. When I try to pin or go back on your site, it doesn’t seem to work. I have to click on the topic list to change the page. Is this just my computer? I want to try the deodorant recipe, but couldn’t pin in until I can get the ingredients together. Any ideas? Awesome recipe! Thanks for linking up at Wildcrafting Wednesday! Sorry for the ignorance but what does the T in the recipe stands for? Second, I’ve heard that essential oils doesn’t respond good to plastic, if it’s true don’t you have a problem putting the deodorant in those containers? It does react to most plastics. I found out the hard way. You have to look for plastic containers that are labeled with a “1” in a triangle looking logo with PET under the logo. This logo is usually found on the bottom of plastic containers, but can show up anywhere on the container. If I am not mistaken, it is now a government regulation that all plastic containers have to be marked with which PET (plastic) they are using. I also believe you can use the ones with a “5” in it, but you will have to research it to be sure. I just made my own a couple days ago. I used coconut oil, cornstarch, and baking soda. I know I would rather use arrowroot, but this was made on a whim and just used what I had. So far no stink and seems to work much better than Tom’s I have been using. Its very solid, kind of wish I had put it in a tube but its in a babyfood jar. I don’t have any essential oils but would love to add some next time. Don’t use baking soda!!! It’s seriously bad for your skin!! 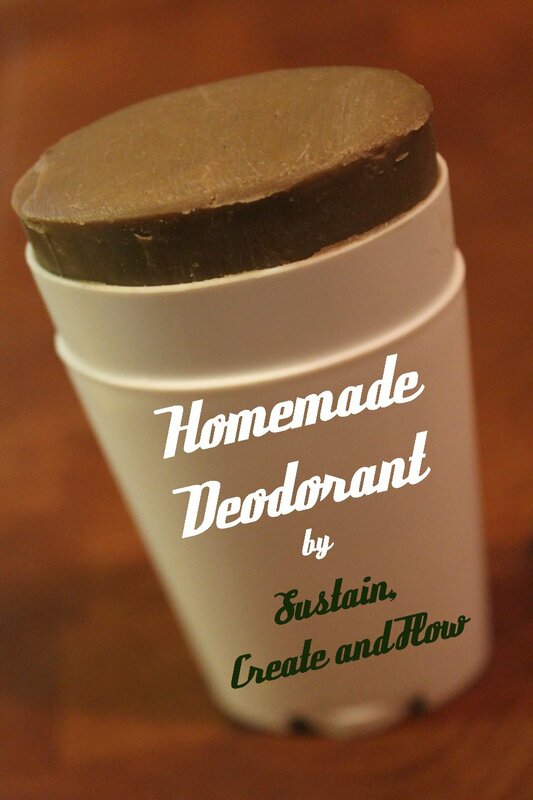 I’ve made the BEST deodorant EVER!…then became allergic to it! I was so thrilled to finally find the perfect deodorant…with baking soda in it…My friends love it, my husband loves it..I LOVED it..but started getting an ugly redness and itchiness. I was seriously crestfallen…Then I researched some more and danced with glee when I read that just substituting the baking soda with arrow root powder would do the trick!…Made it and …whaaaaa!! It was useless on me! I stunk! ..back the the drawing board!…then I found a simple EO mix of 10 drops each of Frankencense, Melaleuca or lemon, Lavender topped off by fractionated Coconut oil in a 10ml roller bottle….It was great for normal days, I thought I finally found one that worked for me…UNTIL… I was actually HOT…Was a humid day, I was fresh from shower, used my deo oil ….and within an hr…I STUNK… it was horrible, every time I moved I could smell myself…NOOOO… I gave it a few more days and just hung my head in defeat!! …To be transparent, I have to add that I’m in the throws of menopause…u know those things called flashes!! So maybe some of the hormonal subterfuge has a baring on my body taking offense to the deodorants I’ve been trying! At any rate…I need something that WORKS! For me AND those in my general vicinity!! lol………….having said all that…I really can’t wait to try this recipe…I hope this is THE ONE!!! It causes rashes because it’s reacting very badly..very *wrongly*…to your skin. It’s literally burning you. Baking soda is great for other stuff, like cleaning. A very, VERY tiny bit in cooking. But it’s not meant for your skin. I recommend asking a dermatologist about natural approaches if you’re concerned about being vegan. Just because it’s natural doesn’t mean it’s good for you; there are a LOT of things in nature that are downright dangerous and deadly, y’know. On the pH scale 1 is acidic, 14 is alkaline…your own skin is 4.5-5.0, baking soda is 9…how does it burn when your skin is more acidic? It may not be the best for your skin, but I like my stuff. If you’re going to comment, please at least have correct information. Try replacing baking soda of your original awesome deodorant formula with milk of magnesia! Have you had any luck finding something else that works? It is ok if I do not add the arrowroot? Or What can I use to replace it? OK I just mixed my first batch. could only find the green clay locally (i live on Maui) and used cornstarch instead of arrowroot but will have arrowroot for round 2. How is it working for you, Julie? Did you get a lovely green color instead of brown? 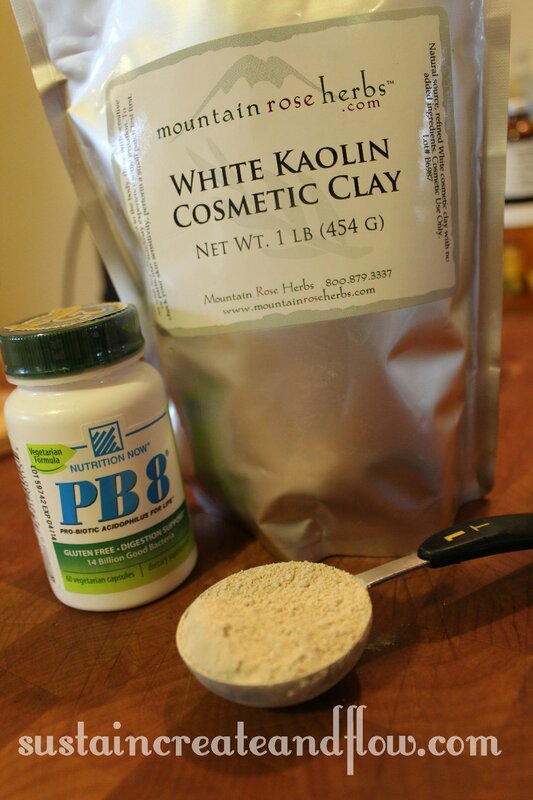 I think next time I am going to try it with the white kaolin to see if there’s any difference. TY, can’t wait to try this! I’m going to make this right now, because baking soda gives me burns, even the tiniest bit. A great post, but I have a question/ logic statement…. It’s my understanding that pro-biotics are bacteria ( good guys ), but it’s also my understanding that essential oils kill bacteria… and don’t discriminate between human-friendly types and other sorts…. So the point would be….?? Sorry that came out sounding wrong… I’m not critcising, just wanted to know if the pro-biotics would survive the essentials at this rate of addition? I think I’ll make it without, anyway. Thanks, you’ve just saved me! I hate chemical deo’s, but they were the only thing that worked ’til now. metal reacts to green clay negatively and causes it to lose its electromagnetic properties, a.k.a the clay’s awesome sucking power, so for those using bentonite clay (also called french clay or green healing clay), put it in a separate glass or ceramic bowl and add the warm mixture of the first five ingredients to the clay. it mixes up just fine. i completely forgot about this and had to scrap my first batch! also, i don’t know if the same goes for other types of clay, but bentonite for sure shouldn’t come into contact with metal. In your post you said “dont get me started on that crystal deodorant stuff.” Could you explain what you meant by that? I use Lafes Spray which is similar to the Crystal brand but now I’m worried. Is there something wrong with it? Here are the ingredients: Aqua (Water), Potassium Alum (Mineral Salts), Aloe Barbadensis* (Aloe Vera) Leaf Extract *Certified Organic. Thank you. The original recipe I used called for 2 Tablespoons of baking soda and it worked fine for the first 2 weeks but then began to cause an awfully irritating rash. I then cut the baking soda to 1 Tablespoon and it worked for about 2 months. Anyway, I kept cutting it down until I came up with this one, which I have been using for 6 months with no problems. The Beeswax keeps it hardened just right and I am easily able to apply the deodorant in my old commercial deodorant container without it melting under my armpits and getting it on my clothes. In addition, I only have to apply it every 2 to 3 days, even with taking a shower in between. I try new Essential Oil variations just about every time. Currently, I use 5 drops of Tea Tree Essential Oil and 20 drops of Ylang Ylang Essential Oil. However, I really like the combination of Tea Tree and Lavender. The next time I make it though, I am planning on adding the Probiotic capsules and adding the Kaolin Clay. Can you make it without the probiotic powder? I don’t have any and don’t really want to buy it just to make deodorant. Thanks.